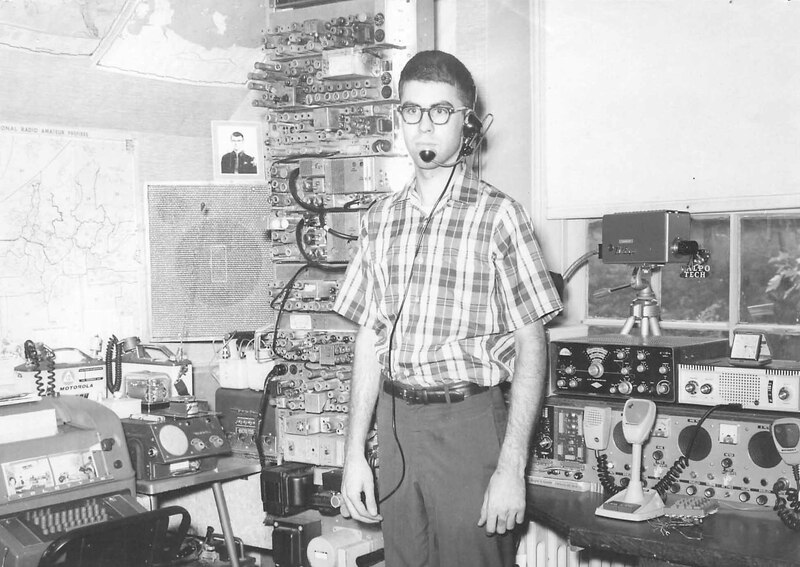 Back in 1963, while attending Valparaiso Technical Institute in Indiana, I became involved with a ham radio project which involved ham radio repeater stations. A repeater station is a transmitter and receiver operating on 2 different frequencies at the same time, usually located on a hill or otherwise high location for the purpose of repeating and extending the range of VHF and UHF radio signals that normally only travel line of site. See block diagram below. My repeater station was built using Motorola equipment, made available from Motorola's used equipment outlet near the school in Indiana. At this time, this was the only outlet for this equipment. Hams in the area were buying it up and making base and mobile stations operating on 52.525 Mhz and 146.94 Mhz and 147.3 Mhz. Repeaters were not operational at this time, even in the hotspot of activity. This area is where FM ham radio started. Typical prices were $20 for the 30D's and $40 for the 80Vs. Hams had to order crystals from one of the many crystal manufacturing companies. (Crystals controlled the receive or transmit frequency.) To the best of my knowledge, I was the first to bring FM equipment to the Philadelphia area (spring 1963) on my spring break from school. There was no one else to talk to. It took about 6 months before another station popped up on "94" and he was also building a repeater. Then, in the next monthss, there was more hams on 94 and at least 2 other repeaters. 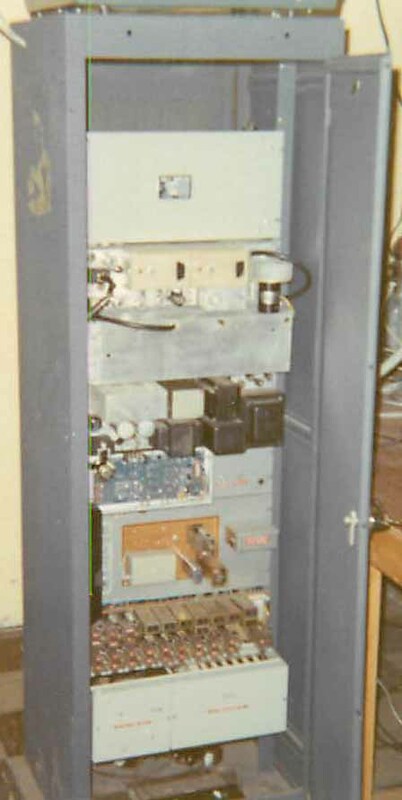 I built my first repeater in the first months of school, spring 1963, using 2 meters 146.94mhz receive and 6 meters 52.525 Mhz transmit. Within the next months, it was improved using both transmit and receive frequencies on 2 meters. By 1966, it finally developed into a 446/449Mhz single site repeater and was later licensed as WA3IGS. I had this idea that I could create a mobile telephone system as part of the initial project. 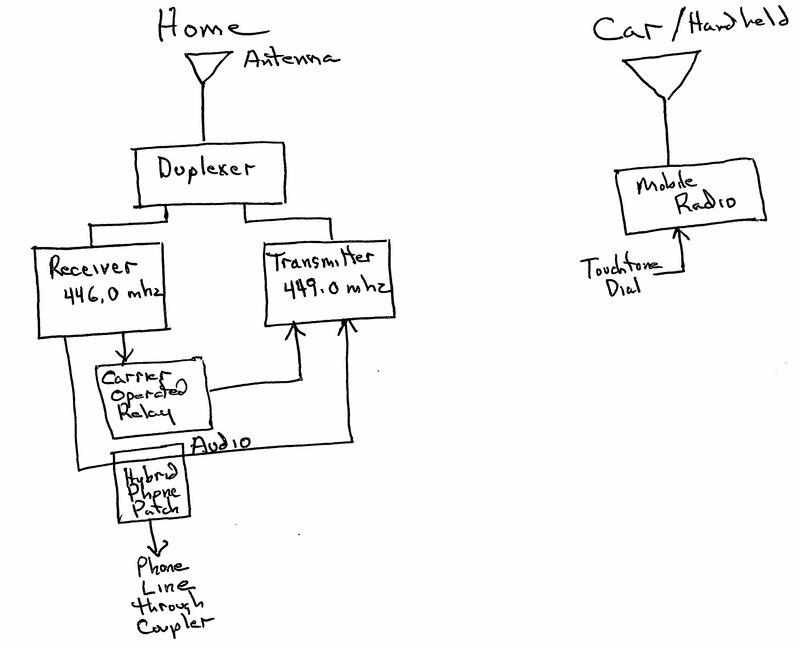 Initially, the first generation 2 band system, connected to my home phone and used a pulsing tone to pass dial pulses from the radio to the phone line. A rotary dial operated the tone pulse generator and a tone receiver counted the dial pulses and broke the phone connection to dial pulse the phone line and dial the number. Touchtone was brand new and not available at this time. Ham radio operators have connected their short wave radio equipment to phone lines for years to connect servicemen overseas to their home and families. This was called "Phone patching." Hybrid phone patches were readily available because of this, so this was used to connect the repeater to the phone line. A mechanical phone lift was used to take the phone on and off hook. Soon after the project was working, I found some touchtone equipment at Greybar Electronics and changed over to a touchtone system. I had a range of 30 to 40 miles and sometimes more from there and the system was impressive. I even bought a used Motorola handie talkie and mounted a touchtone dial to the back of it. This made a very portable wireless system that worked 10 to 20 miles from my house. I could make and answer calls from almost anywhere I went. I even demonstrated the system to over 300 ham radio operators at a meeting at the GE Space Center in 1970 where 2 ham radio groups (Las Voyagers and Main Line VHF Association) merged to form a larger group (the Philadelphia Area Repeater Association) to build their own autopatch system for all to use on the 2 meter ham band. What I didn't mention so far, is that in 1965, I started working for AT&T Long Lines after I graduated from Valpo Tech. Mention of the system at work drew lots of questions and skepticism. The system was simply not understood. Remember now, that connecting anything to your phone line during this period of time was considered taboo. I even went so far as to pay for what was called a coupler from Bell Telephone to try to stay on the up and up. Everything was great for years until one day, my mobile phone rang while I was waiting for a roller rink to open. As I answered the call, the guy in the car next to me became curious and started asking questions. I explained what I had and how it worked. He then told me what he had. He said he had a device that could call anywhere in the world and that the calls would be free of charge. I listened carefully. The next day, I told my supervisor at work. I also told a ham friend who worked in the district office at AT&T. Both told me it was not possible for him to have such a device or he would be caught. This guy called me one day and I asked more questions to learn of this impossible device. He told me more and even patched me in so I could hear some of his calls. He called me one day at work too and became a pain. I did try to learn more. I told others at work about this guy and they didn't believe it. I heard enough to know something big was going on, so I attempted to find someone else at AT&T or Bell that would listen. I finally did, but they asked why I was telling them. That night, their was a knock at my door. There was a policemen along with 2 other guys. They had a search warrant and search my house they did. I had nothing to hide so I showed them around. They confiscated by handie talkie and also the touch tone dial from my car along with other ham equipment. They asked me to go to West Chester and answer more questions. I did. I found out they had been taping all my phone calls for weeks. They then said I was under arrest. They claimed I had conspired with this other guy to defraud the phone system. It took almost 2 years before the legal matter was cleared up. Meanwhile, I initiated a rather large lawsuit. The lawsuit was not settled for almost 8 years. Oh, I forgot to mention, my arrest led to my loss of job at AT&T. It also led me to the building of the Roller Rink in Kimberton where I made a much better living. Some of the early equipment used was Motorola 30D's, separate receivers and transmitters. They were mounted, stacked on top of each other. Generation 2 was Motorola 80V's. These were single package transceivers. Base station equipment for this generation was stripped out of the cases and rack mounted as seen in the older picture from the Merion station. Third generation equipment included T44's. One of these was stripped for the base and mounted in the rack also. The FM station operated on 6 and 2 meters and 446 Mhz. The handie talkie was also Motorola. The touchtone dial was manufactured by Strongberg Carlson.